Gene expression analysis is an important tool in contemporary research, with real-time PCR as the method of choice for quantifying transcription levels. Co-analysis of suitable reference genes is crucial for accurate expression normalisation. Reference gene expression may vary, e.g., among species or tissues; thus, candidate genes must be tested prior to use in expression studies. The domestic cat is an important study subject in both medical research and veterinary medicine. The aim of the present study was to develop TaqMan® real-time PCR assays for eight potential reference genes and to test their applicability for feline samples, including blood, lymphoid, endocrine, and gastrointestinal tissues from healthy cats, and neoplastic tissues from FeLV-infected cats. RNA extraction from tissues was optimised for minimal genomic DNA (gDNA) contamination without use of a DNase treatment. Real-time PCR assays were established and optimised for v-abl Abelson murine leukaemia viral oncogene homolog (ABL), β-actin (ACTB), β-2-microglobulin (B2M), β-glucuronidase (GUSB), hydroxymethyl-bilane synthase (HMBS), hypoxanthine phosphoribosyltransferase (HPRT), ribosomal protein S7 (RPS7), and tryptophan 5-monooxygenase activation protein, zeta polypeptide (YWHAZ). The presence of pseudogenes was confirmed for four of the eight investigated genes (ACTB, HPRT, RPS7, and YWHAZ). The assays were tested together with previously developed TaqMan® assays for feline glyceraldehyde-3-phosphate dehydrogenase (GAPDH) and the universal 18S rRNA gene. Significant differences were found among the expression levels of the ten candidate reference genes, with a ~106-fold expression difference between the most abundant (18S rRNA) and the least abundant genes (ABL, GUSB, and HMBS). The expression stability determined by the geNorm and NormFinder programs differed significantly. Using the ANOVA-based NormFinder program, RPS7 was the most stable gene in the tissues studied, followed by ACTB and ABL; B2M, HPRT, and the 18S rRNA genes were the least stable ones. The reference gene expression stability varied considerably among the feline tissues investigated. No tested gene was optimal for normalisation in all tissues. For the majority of the tissues, two to three reference genes were necessary for accurate normalisation. The present study yields essential information on the correct choice of feline reference genes depending on the tissues analysed. The domestic cat is an important study subject not only in veterinary medicine but also in medical research. It plays an essential role as a laboratory model for human infectious, hereditary and endocrine diseases and allows the study of topics such as host-pathogen interactions, defence mechanisms, and development of prophylactic or therapeutic regimens. Of importance in this context is not only the feline immunodeficiency virus, the single naturally occurring animal model for HIV-AIDS pathogenesis [1, 2] and the feline leukaemia virus (FeLV), an important model for retrovirus and tumour research [3, 4], but also other infectious agents, some related to fatal human diseases [1, 5]. Furthermore, in the genome of the cat, various mutations have been characterised that are associated with genetic diseases, and 280 phenes have been reported, 136 of which could potentially serve as models for human hereditary diseases http://omia.angis.org.au/. Models under investigation include the glycogen storage disease type IV reported in the Norwegian Forest cat, the only reported animal model for this pathology , or the obesity-associated form of diabetes mellitus in the domestic cat that is similar to the type 2 diabetes mellitus in humans . For the latter, the domestic cat presents a valuable model for understanding the molecular mechanisms linking obesity to the development of insulin resistance, hypertension, and atherosclerosis . The potential of the cat as an animal model and the similarities in genome organisation between humans and felids [8, 9] provide the basis for a wide range of gene expression studies. Quantitative real-time PCR assays are a method of choice for reliable and fast quantification of transcription levels in gene expression studies, and they are used frequently in many areas of modern research. Real-time PCR provides quantification of input templates over a broad linear range, low sample consumption, rapid throughput of large sample numbers, and low risk of contamination [10–12]. Accurate normalisation is of fundamental importance to obtaining sound results. Normalisation is usually achieved by simultaneous amplification of reference genes along with the target gene. Several publications emphasise the need for more than one reference gene for exact analysis of transcription levels [13–15]. When selecting reference genes, several critical points should be considered, including a stable, experimentally-independent expression pattern of the candidate gene, the absence of processed pseudogenes, an adequate level of expression, and a lack of potential co-regulation among target and reference genes [16–18]. For the domestic cat a number of potential reference genes have been studied using pair-wise correlation analysis (geNorm)  and real-time PCR systems based mainly on SYBR Green chemistry [13, 20–22]. The SYBR Green principle has the advantage that it is less costly; however, TaqMan® systems usually have a higher specificity and lead to less non-specific product formation than SYBR Green assays. No systematic study using TaqMan® real-time PCR assays for potential feline reference genes is available. In addition, no comparisons of pair-wise analysis with ANOVA-based methods (NormFinder)  have been published, and most assays for feline reference genes were conducted using pathological samples. Data on tissues from healthy cats are largely missing. Thus, the purpose of the present study was to i) develop and optimise TaqMan® real-time PCR assays for potential feline reference genes and ii) evaluate the suitability of these assays for normalisation in the blood and other tissues from clinically healthy cats and neoplastic tissues. The earlier tissues were chosen to cover those frequently included in studies investigating infectious diseases and immunological, endocrine, metabolic, and inflammatory disorders. The neoplastic tissues originated from FeLV-infected cats; the expression of reference genes may differ in neoplastic tissues [16, 24]. For stability comparison of the potential reference genes, two programs were used: the ANOVA-based NormFinder and the geNorm. All domestic cats included in this study had been in experimental studies officially approved by the veterinary office of the appropriate Swiss Canton. They were kept in groups under optimal ethological conditions. Clinically healthy cats were available from negative control groups, and they were sacrificed for reasons unrelated to this study. Tissue samples were collected upon necropsy from 15 clinically healthy cats (ten neutered males and five intact females). The tissues were histologically examined and verified to be free of pathological alterations. They originated from lymphatic tissues including bone marrow (n = 11), mesenteric lymph node (n = 10), and spleen (n = 10); from the endocrine tissues of the adrenal gland (n = 11), pancreas (n = 13), thyroid (n = 10), and parathyroid (n = 7); from the gastrointestinal tissues of the parotid gland (n = 9), duodenum (n = 10), and ileum (n = 10); and from the brain (n = 13), myocardium (n = 10), kidney (n = 14), and liver (n = 9). The cats ranged in age from 1.25 to 13 years (median age 3.8 years). In addition, EDTA-anticoagulated whole blood samples were collected from 11 specific pathogen-free (SPF) cats (five males at the age of 0.5 years, five neutered males at 6 years, and two spayed females at 14 years). Upon necropsy, neoplastic tissues (n = 12, including tissue from liver (1), spleen (2), kidney (2), mesenteric lymph node (3), ileum (1), and thymus (3) were collected from six FeLV-infected cats (three neutered males, one neutered and two intact females; ages of 3 to 13 years). Five of the cats had been diagnosed with malignant lymphoma; one had leucosis. All tissues were snap-frozen upon collection and stored at -80°C until extraction of nucleic acids. Tissues (30-35 mg, in duplicate) were homogenised prior to RNA extraction in 350 μl of RLT buffer (Qiagen, Hombrechtikon, Switzerland) containing 3.5 μl β-mercaptoethanol, together with a 5 mm Ø steel bead (Schieritz & Hauenstein, Arlesheim, Switzerland) in a Mixer Mill MM 300 (Retsch, Haan, Germany). Samples were then processed using the RNeasy Mini Kit (Qiagen) following the manufacturer's recommendations. In a preliminary experiment using selected samples (n = 10), the effect of a digestion step on the RNA binding silica gel membrane of the spin column, performed according to the manufacturer's instructions with RNase-free DNase, was assessed (on-column DNase treatment). In addition, for bone marrow, lymph node, spleen, and thyroid samples, the RNeasy Plus Mini Kit (Qiagen) with genomic DNA (gDNA) Eliminator spin columns and RLT plus buffer was applied according to the manufacturer's recommendations. The presence of contaminating gDNA was assessed using GAPDH quantitative reverse transcriptase (RT-) PCR with a minus-reverse transcription control with Reverse Transcriptase qPCR Mastermix (Eurogentec, Seraing, Belgium). RNA was extracted from 1 ml of blood within 60 minutes of collection using the QIAamp RNA Blood Mini Kit (Qiagen) and stored at -80°C until further use. gDNA was extracted from tissues using the DNeasy Blood & Tissue Kit (Qiagen). For all RNA and DNA extractions, negative controls consisting of 100 μl of phosphate buffered saline were prepared with each batch to monitor for cross-contamination. The RNA yield and the ratio of absorbance at 260 nm to 280 nm (A260/A280 ratio) were measured using the NanoDrop ND-1000 Spectrophotometer (NanoDrop Technologies, Witec, Littau, Switzerland). Samples containing < 10 ng/μl of RNA were excluded from the study. First-strand cDNA was synthesised in quadruplicate using the High Capacity cDNA Reverse Transcription Kit (Applied Biosystems, Rotkreuz, Switzerland) and random primers according to the manufacturer's instructions. The amount of input RNA in each reaction was calculated to be 2 μg. The cDNA GAPDH copy number/RNA GAPDH copy number ratio was calculated as a measure of the efficiency of the cDNA synthesis; this ratio was used to normalise the reference gene copy numbers as assessed by quantitative real-time PCR. Using Primer Express™ software (versions 2 and 3, Applied Biosystems), primers and TaqMan® probes were designed for eight potential reference genes: ABL, ACTB, B2M, GUSB, HMBS, HPRT, RPS7, and YWHAZ (essential gene-specific data are given in Table 1). The sequences and information on gene organisation were retrieved from Ensembl http://www.ensembl.org/index.html, GenBank http://www.ncbi.nlm.nih.gov and the Genome Annotation Resource Fields (GARFIELD) http://lgd.abcc.ncifcrf.gov. All systems were designed so that the predicted amplicons would span exon-exon boundaries (Table 2). The eight primer pairs (Microsynth, Balgach, Switzerland) were tested for amplification of the appropriate amplicon length using 5 μl of cDNA in a total volume of 25 μl per reaction on a Rotor-Gene 6000 real-time rotary analyser (Corbett, Mortlake, Australia) using the TaqMan® Fast Universal PCR Master Mix (Applied Biosystems). Thermocycling conditions consisted of an initial denaturation of 20 s at 95°C, followed by 45 cycles of 95°C for 3 s and 60°C for 45 s. The PCR products were analysed by gel electrophoresis on 3% agarose gels and stained with ethidium bromide, and bands were visualised using the Chemigenius2 BioImaging System (Syngene, Cambridge, UK). In order to test for potential amplification of pseudogenes or of gDNA, the eight primer pairs were also assayed with gDNA under the same conditions. Moreover, the possible presence of pseudogenes for the eight assays was assessed using the Ensembl Genome Browser. In all PCR assays, water was used as a negative control. After the primers had been tested for correct amplification of the estimated amplicon length, the eight newly designed real-time TaqMan® PCR systems were optimised using cDNA and a 3 × 3 primer matrix with 50, 300, and 900 nM end concentrations. Each of the nine conditions was run in quadruplicate under the conditions described above. Moreover, using the best primer concentration, five different probe (Microsynth) end concentrations (50, 100, 150, 200, and 250 nM) were tested for optimal performance. The optimised assays were tested together with a feline GAPDH TaqMan® real-time PCR assay developed previously in our laboratory  and a universal 18S rRNA gene (Applied Biosystems). cDNA synthesised from feline tissue samples was used to generate standard templates for absolute quantification of ABL, ACTB, B2M, GUSB, HMBS, RPS7, and YWHAZ. The corresponding sequences were amplified using primers enclosing the TaqMan® real-time PCR sequences under conditions described (Table 3) . The gel purified amplification products (Gen Elute PCR Clean-Up Kit, Sigma-Aldrich, Buchs, Switzerland) were subjected to a 3' A-tailing reaction (Sigma) and ligated into the TOPO TA cloning vector pCRII (Invitrogen, Basel, Switzerland), selected by Ampicillin resistance, followed by sequencing (Microsynth). Plasmids were linearised by restriction digestion with BamH I (Promega, Wallisellen, Switzerland), Spe I (New England BioLabs, Berverly, MA, USA), or Kpn I (Roche, Rotkreuz, Switzerland) and then gel purified. The copy numbers were calculated based on spectrophotometric analysis (NanoDrop ND-1000). Carrier salmon sperm DNA (Invitrogen) at a concentration of 30 μg/ml was used for the tenfold serial dilutions of the standard templates, and aliquots of the dilutions were stored at -20°C until use. For the GAPDH assay, the DNA standard described previously  was used. For the HPRT and 18S rRNA assays, cDNA from kidney tissue of a clinically healthy cat was diluted tenfold in carrier salmon sperm DNA and in nuclease free water, respectively, to produce an arbitrary standard. The copy numbers of the latter samples were estimated by matching the resulting threshold cycle (Ct) values with those of the feline GAPDH standard. The efficiency of the newly designed assays was calculated as described  using the following equation: E = (10(-1/slope))-1. The sensitivity of the seven new systems (for which DNA standards had been produced) was determined by an endpoint dilution experiment: ten replicates of the dilutions containing 102, 101, and 100 standard template copies per reaction, respectively, were tested. The sensitivity of the assay is given by the dilution in which at least seven of 10 replicates are still positive . The linear range of amplification and the precision of all newly developed TaqMan® real-time PCR assays were determined using tenfold serial dilutions of the plasmid or arbitrary standards. For the precision analysis, the dilutions were chosen according to the ranges of Ct values that were characteristic for the expression levels of the particular reference genes in the tissues. Intra-run (n = 10) and between-run (n = 5) analytical performances of the PCR measurements were determined using these control materials. For stability comparison of candidate reference genes, the Microsoft Excel Add-in NormFinder  was applied. Comparisons were made with calculations performed using the geNorm version 3.4 . The NormFinder uses an ANOVA-based model , while the geNorm calculates the stability using a pairwise comparison model . In addition, the geNorm ranks candidate reference genes according to the average expression stability, M . Genes with the lowest M values have the most stable expression; a cut-off of 1.5 was proposed, above which the variation is assumed to be too high for accurate normalisation . Moreover, the optimal number of reference genes required for accurate normalisation was estimated using the geNorm. To this end, the pairwise variation Vn/n+1between sequential normalisation factors containing an increasing number of reference genes was calculated. If Vn/n+1< 0.15, the recommended number of reference genes is given by n; the inclusion of an additional reference gene is not required . Statistical analyses were performed with GraphPad Prism for Windows, Version 4.03 (GraphPad software, San Diego, CA). 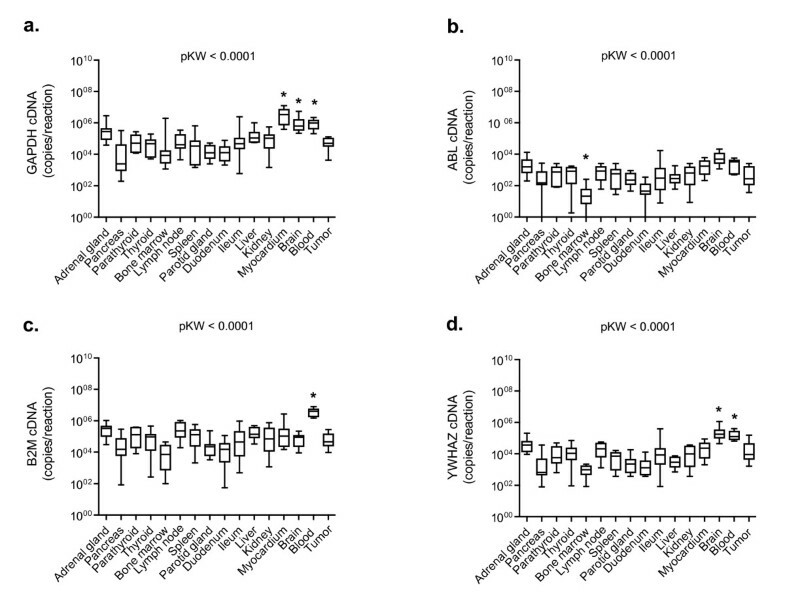 Expression levels of individual genes in different tissues were tested for statistical differences among several groups using the non-parametric Kruskal-Wallis test (pKW) and the Dunn's Multiple Comparison Test (pD). The expression levels of different genes in individual samples were tested for statistical differences between two groups using the non-parametric Wilcoxon signed rank test for paired samples (pW) and among several groups using the non-parametric Friedman test for paired samples (pF) and the Dunn's Multiple Comparison Test (pD). P-values < 0.05 were considered significantly different. RNA extractions from blood using the QIAamp Blood Mini Kit and from tissues using the RNeasy Mini Kit yielded RNA with a low level of contaminating gDNA (< 1%), with the exceptions of bone marrow, lymph node, spleen, and thyroid. When RNA extraction was performed for these four tissues using the RNeasy Plus Mini Kit, contaminating gDNA levels were < 1%. These additionally processed RNA samples were used for analysis of these four tissues. No on-column DNase treatment was used in the main experiment because the loss of RNA due to DNase treatment was > 85%, as determined in a preliminary experiment (data not shown). RNA purity was estimated from A260/A280 ratio; this ratio ranged from 1.7 to 2.1. When the primers were tested in a conventional PCR with cDNA, all assays yielded PCR products of the predicted size (Table 2). The primers were then assessed using the same procedure and gDNA to test for the amplification of gDNA and the possible presence of pseudogenes. Bands of the size of the cDNA were found for ACTB, HPRT, RPS7, and YWHAZ, indicating the presence of processed pseudogenes for these genes, but not for ABL, B2M, HMBS, and GUSB (Table 2). This was consistent with the results retrieved from Ensembl. In addition, for ACTB, GUSB, and HMBS, PCR products presumably of the size of the gDNA, including the introns, were detected (Table 2). Primer and probe concentrations for the eight newly designed TaqMan® real-time PCR assays were optimised using cDNA (for final concentrations see Table 4). When the real-time TaqMan® PCR assays were tested using gDNA instead of cDNA, specific amplification was found for ACTB, HPRT, RPS7, and YWHAZ, confirming the presence of pseudogenes (Table 2). In addition, amplification was detected for GUSB (Table 2). The amplification efficiencies of the eight newly designed assays and the feline GAPDH real-time PCR were ≥96%. The lower detection limit of the assays for ABL, ACTB, B2M, GUSB, RPS7, and YWHAZ was equal to one copy of target standard plasmid per reaction in an endpoint dilution experiment (7 to 10 out of 10 reactions positive). For HMBS the lower limit of detection was < 100 copies per reaction (10 out of 10 reactions positive). For all newly developed TaqMan® real-time PCR assays, we observed linearity of the assay over a ≥108-fold range. The coefficients of variation ranged from 0.44% (B2M) to 1.18% (YWHAZ) for the intra-run precision analysis and from 0.49% (ACTB) to 2.15% (HMBS) for the between-run analysis. Transcription of the ten candidate reference genes was detectable above background in all tissue and blood samples from all cats tested. The potential reference genes were classified into three groups according to their transcription levels (all healthy tissues and blood samples were included in the analysis; Figure 1a). The difference in median expression levels was 106 between the most abundant and least abundant transcripts: 18S rRNA showed a high transcription level (median copy number/reaction ~109); ACTB, GAPDH, B2M, HPRT, and RPS7 were found to have intermediate transcription levels (median copy number/reaction 2.6 × 104 to 9.3 × 104), and ABL, GUSB, and HMBS had low transcription levels (median copy number/reaction 0.5 × 103 to 1.9 × 103; Figure 1a). YWHAZ had a transcription level between the intermediate and low levels (median copy number/reaction 6.9 × 103). Individual candidate reference genes had different expression levels across all studied tissues; the transcription levels differed significantly among all different reference genes when all tissues were included in the analysis (pF < 0.0001; pD < 0.05), with the exceptions of ACTB, GAPDH and B2M; GUSB and HMBS; and HPRT and RPS7 (Figure 1a). The latter three groups of reference genes did not have significantly different transcription levels (pD > 0.05; Figure 1a). A reference gene transcription level pattern similar to that seen in all tissues combined was found when individual tissues were examined (for a representative example, see Figure 1b), with the following particular exceptions. In the bone marrow samples HMBS transcription was significantly higher than GUSB transcription (pW = 0.0010; Figure 1c), in the myocardium and brain samples GAPDH transcription was significantly higher than B2M transcription (pW = 0.0020; Figure 1d and 1e), in the blood B2M and ACTB transcription levels were higher than GAPDH transcription (pW = 0.0039; Figure 1f), and in the liver YWHAZ was significantly lower than RPS7 and HPRT (pW = 0.0039, data not shown). When expression levels of the individual potential reference genes were analysed among different tissues significant differences were found. 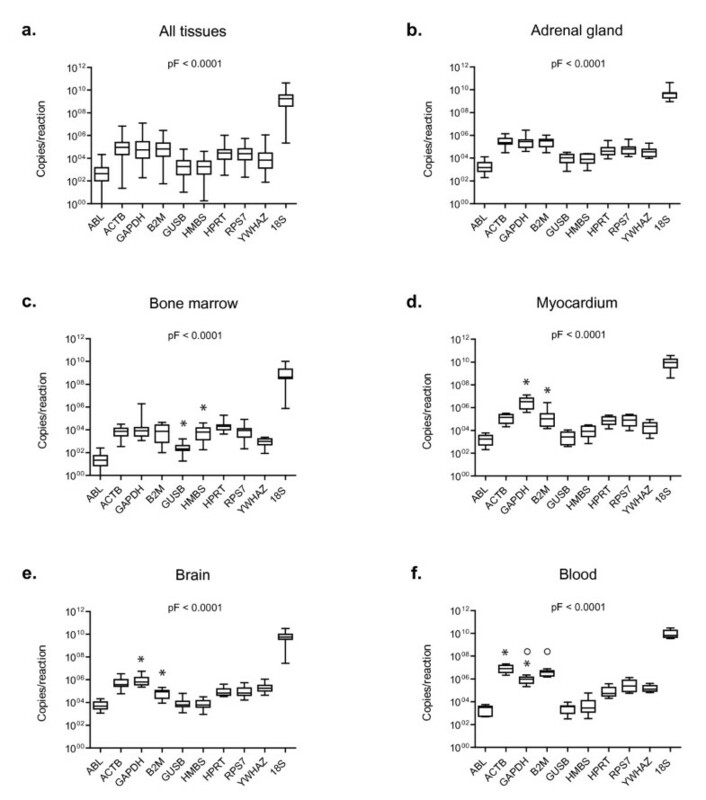 The most prominent were the following: GAPDH was significantly higher in the myocardium, brain, and blood samples than in most of the other tested tissues (pKW < 0.0001; pD < 0.001 for 11 of the other tested tissues; Figure 2a); ABL was significantly lower in the bone marrow samples than in the majority of the other tested tissues (pKW < 0.0001; pD < 0.001 for eight of the other tested tissues; Figure 2b), B2M was higher in the blood samples (pKW < 0.0001; pD < 0.001 for twelve of the other tested tissues; Figure 2c), and YWHAZ was higher in the blood and brain samples than in the majority of the other tissue samples (pKW < 0.0001; pD < 0.001 for 11 and 12, respectively, of the other tested tissues; Figure 2d). No particular differences in expression levels were observed when the neoplastic tissues were compared to the healthy tissues (pW > 0.05 for all genes tested; data not shown). Expression levels of candidate reference genes in different tissues. a) All healthy tissues combined, b) adrenal gland, c) bone marrow, d) myocardium, e) brain, and f) blood samples. Values are given as copy numbers per PCR. For the 18S rRNA gene and HPRT the copy numbers were calculated using an arbitrary standard (see M&M). Data are shown as box plots. Boxes extend from the 25th to the 75th percentile; a horizontal line represents the median, and the error bars extend down to the smallest and up to the largest value. Expression levels were analyzed for statistical differences using the Friedman test (pF-values as indicated in the figure). Significant differences between two particular genes were analyzed by the Wilcoxon test for paired samples (asterisks and circles, respectively, mark statistically significant differences between two genes; pW ≤ 0.0039). Expression levels of selected reference genes in individual tissues. a) GAPDH, b) ABL, c) B2M, and d) YWHAZ. Values are given as copy numbers per PCR. Data are shown as box plots. Boxes extend from the 25th to the 75th percentile; a horizontal line represents the median, and the error bars extend down to the smallest and up to the largest value. Expression levels were tested for statistical differences by the Kruskal-Wallis test (pKW-values as indicated in the figure) and the Dunn's post test (asterisks indicate statistically significant differences; pD < 0.001). The stability of reference gene expression was estimated based on the calculations of the geNorm and NormFinder software, and the rank order given by the two programs differed significantly (Table 5; for details see also Additional Files 1 and 2). However, partial agreement was found between the NormFinder results and the results according to the M values of the geNorm program (Table 5); for three tissues (bone marrow, duodenum, and kidney) the rank order was identical. The two genes that ranked best were identical with both methods (manual M value ranking and NormFinder) for the majority of the tissues except for lymph node, parotid gland, liver, and blood samples. All further stability analyses were made using the NormFinder results. The expression stability is given as stability values calculated by NormFinder (NF), M values calculated by geNorm (gN(M)), and geNorm calculations (gN). Rankings are shown from most (left) to least (right) stable genes. The stability of the genes varied considerably depending on the tissues tested. When tissues were analysed individually, no single gene was found among the three best-ranked genes in all of the tested tissues. In 11 of the 14 healthy tissues, RPS7 ranked among the three most stable genes, followed by ACTB in eight and ABL in six out of 14 tissues (Table 5). Less stable were GUSB and YWHAZ; they were among the most stable genes in five of the 14 tissues used. GAPDH was among the three most stable genes in the NormFinder ranking in four out of 14 tissues. HMBS, B2M, HPRT, and 18S rRNA were the least stable, HMBS with two, B2M and HPRT with one, and 18S rRNA with no rankings among the most stable genes in the 14 tissues tested. When all 14 healthy tissues were included at once in the analysis (Table 5), RPS7, GUSB, and YWHAZ ranked as the best three reference genes, while ABL and ACTB ranked fourth and fifth. Exceptions were found in certain healthy tissues; RPS7 was less stable in the ileum, lymph node, and thyroid samples. Moreover, ACTB ranked last in the pancreas samples (Table 5). In the blood samples, GAPDH and B2M ranked better than in other tissues, but RPS7 ranked only second to last (Table 5). Remarkably, in the neoplastic tissues the two most stable genes were identical to those in all the healthy tissues (RPS7 and ACTB). ABL, GUSB, and YWHAZ were less stable than in the healthy tissues (Table 5). The optimal number of reference genes for normalisation was calculated using the geNorm program. The number of recommended reference genes for optimal normalisation varied considerably depending on the tissue being tested. For brain, myocardium, lymph node, and adrenal gland the pairwise variation V2/3 was ≤ the proposed cut-off of 0.15 (Additional File 2); therefore, two reference genes should be sufficient for accurate normalisation in those tissues. Similarly, for parathyroid, parotid gland, liver and kidney, three; for thyroid, four; for spleen and neoplastic tissues, five; and for blood, seven reference genes were necessary for accurate normalisation according to the geNorm program (Additional File 2). For four tissues the pairwise variation V always exceeded the cut-off of 0.15. The recommended number of reference genes for these four tissues (lowest V value) was: five for the pancreas, six for ileum and bone marrow, and seven for the duodenum (Additional File 2). For all tissues combined, the optimal number of reference genes that would have been necessary for normalisation exceeded ten using the reference genes tested in this study. For the three tissue groups, endocrine, lymphatic, and gastrointestinal tissues, the V value always exceeded the cut-off of 0.15; the recommended number of reference genes for these tissue groups (lowest V value) was six (Additional File 2). When tissues were analysed individually, a normalisation factor was calculated for all tissues with the exception of the pancreas. For the latter, all M values calculated by geNorm exceeded the proposed cut-off value of 1.5, and no normalisation factors based on the geometric mean of multiple reference genes could be computed (Additional File 2). When tissue groups were analysed, a normalisation factor was calculated for the endocrine and gastrointestinal tissues but not for the lymphatic group. No normalisation factor was calculated for all tissues combined. The present study is the first to develop and evaluate real-time TaqMan® assays for the quantification of a series of potential feline reference genes. The assays were applied using feline peripheral blood and tissue samples from healthy cats. The latter were chosen based on their applicability in research areas such as the investigation of immune functions or metabolism, characterisation of infections, inflammatory reactions, or excretion patterns of pathogens. In this regard, the selected tissue categories also met the claim of suitability regarding their potential use in animal models for several human diseases. The expression stability of potential reference genes was analysed and compared for the feline species for the first time using pair-wise and ANOVA-based analyses; the two methods yielded discrepant results concerning the gene expression stability. We selected ten commonly used mammalian reference genes featuring a broad range of cellular functions (Table 1). Some other potential candidate genes, such as Cyclophilin A, the TATA box binding protein or the transferring receptor CD71, were not included because they are regulated by or known to interact with retroviruses [30–33]; the latter are a major research interest of our group. Recently it was reported that nine of the ten selected genes, i.e., ACTB, ABL, B2M, GAPDH, GUSB, HMBS, HPRT, YWHAZ, and the 18S rRNA gene, are assumed not to be co-regulated [19, 34, 35]. Processed pseudogenes are known to hamper data interpretation in mRNA transcription analysis [36, 37]. We therefore included potential reference genes that are known to lack pseudogenes in humans, i.e., ABL, B2M, GUSB, and HMBS [36, 38]. We confirmed that these four genes also lack pseudogenes in the cat (at least for the sequences included in our assays). For the other four newly developed assays (ACTB, HPRT, RPS7, and YWHAZ), we demonstrated the presence of processed pseudogenes. For feline GAPDH the presence of one copy of a pseudogene had been reported earlier . To minimise co-amplification of pseudogenes, gDNA contamination of the assayed RNA was reduced to a minimum by choosing the optimal RNA extraction method for each tissue. The inclusion of a DNase digestion step was omitted because it significantly reduced the RNA yield. The absence of a DNase treatment and thus the presence of sufficient amounts of RNA may explain why the PCR signals were clearly above background for all samples, in contrast to other reports in which HPRT, ABL, or HMBS could not (reliably) be detected [17, 40]. We designed the eight new assays to span an exon-exon junction in order to reduce the possible interference of gDNA - including conventional but not processed pseudogenes. The assays for those four potential reference genes lacking processed pseudogenes did not amplify gDNA, with the exception of GUSB. For the latter, the amplicon size from gDNA was only 532 bp due to a short intron and the primer design software had positioned the exon-exon junction only three nucleotides before the 3' end of the probe (Table 2). The expression level of an ideal reference gene should not undergo tissue-specific and experimentally-dependent variation and should be similar to that of the target genes [16–19, 41, 42]. The RNA transcription levels of the ten selected candidate reference genes in the blood samples and 15 tissues differed considerably, but most of them were within a range that could be used for proper normalisation of many target genes. Only the 18S rRNA gene expression level was impracticably high. Significant differences were found when the expression levels of the potential reference genes were analysed in different tissues. GAPDH expression was higher in brain, myocardium, and blood samples; this is consistent with results reported for human tissues [19, 43]. B2M expression was significantly higher in blood. This has also been demonstrated for human leukocytes . The expression stability of the tested reference genes was calculated using the NormFinder and the geNorm software. The geNorm uses a pairwise comparison model that provides a combination of two genes whose expressions are most correlated in the tested sample , while the ANOVA-based model of the NormFinder program selects the highest ranked gene based on the highest expression stability due to minimal estimated intra- and intergroup variation . Using the geNorm, co-regulated genes may become highly ranked independent of their expression stabilities . In contrast, the ANOVA-based approach is not significantly affected by co-regulation of candidate reference genes . Therefore, the differences found between the reference gene rankings automatically produced by the two programs may indicate that at least some of the examined genes were co-regulated. A better agreement was found between the automatic NormFinder ranking and the ranking performed manually using the geNorm M values. To our knowledge, the differences observed between the automatically calculated geNorm gene ranking and the ranking using the M values of the geNorm program has not been reported previously. Studies of the validation of reference gene expression have been performed for different mammalian species including humans [17, 19, 38, 44], companion animals [13, 14, 45, 46], farm animals [47–50], and horses [51, 52]. No general best reference gene has been found for all species. Moreover and in agreement with findings from other species [17, 41, 42, 53], in the cat no single gene was suitable for accurate normalisation in all investigated tissues. This highlights the need for proper validation of reference genes in the respective tissues preceding any experimental set-up. It has been demonstrated that normalisation of data sets with different reference genes, such as GAPDH and ACTB, may influence the outcome of the study; the expression profiles of target genes were markedly influenced and statistically significant differences between study groups were present or absent depending on the choice of the reference genes [54–56]. For the majority of the examined feline healthy tissues RPS7, ACTB, and ABL were among the most stably expressed genes. When all healthy tissues were combined for analysis, the three most stable genes were RPS7, GUSB, and YWHAZ. These results are only partially in agreement with those of a recent validation of feline reference genes using SYBR Green real-time PCR assays and pairwise analysis . In the latter study, RPS7 was also found as the most stable gene in six tissues under investigation; YWHAZ ranked fourth (after two ribosomal protein genes not included in the present study), and GUSB was found among the least stable genes; ACTB and ABL were not examined . Three feline tissues were included in both the previous  and the present study. While for the kidney a partial agreement was found in the gene ranking (RPS7 and YWHAZ were among the stable ones; HPRT and GAPDH were rather unstable), the results for liver and myocardium differed significantly. The observed discrepancy may be (apart from the differences in the applied PCR and mathematical methods) due to the tissues under investigation. We based our evaluation primarily on tissues from healthy cats. In contrast, the study from Penning and co-workers  used mainly pathological tissues. Pathological processes can alter the expression levels of reference genes [55, 57], therefore it is of importance to evaluate potential reference genes in healthy tissues. Generally, healthy tissues are included in most study design as internal controls. Thus, with the present study, we provide baseline data on reference genes for many future studies investigating feline tissues. Furthermore, the number of samples studied may have influenced the evaluation: in the previous study, for the majority of the tissues, a small number of identical samples (i.e. kidney: n = 2 healthy tissue; n = 3 tumours; n = 3 chronic kidney failure) was available . Although in the present study B2M in general was not a very stable reference gene in the tissues, it ranked second to fourth in stability in the blood samples. This would confirm a finding in human blood cells, where B2M seemed a good choice for normalisation in leukocytes, while it was one of the least stable genes in tissues . For the neoplastic tissues, only a limited number of samples from FeLV-infected cats with malignant lymphoma and leucosis were available. The gene ranking order but not the expression levels of the reference genes in the neoplastic tissues differed significantly from those in the healthy tissues. Nonetheless, the two most stable genes in the neoplastic tissues (RPS7 and ACTB) were identical to those in the investigated healthy tissues. Thus, these two genes could serve as a good first choice to be tested in neoplastic tissues in future studies. Using the geNorm program, we calculated that two to three reference genes were required for accurate normalisation in most tissues. According to Vandesompele and co-workers, using the three best reference genes is a valid normalisation strategy in most cases; it results in much more accurate and reliable normalisation than the use of only one reference gene does . The use of a limited number of reference genes is also supported by the finding that no significant effect on the relative quantity of the target gene expression was demonstrated when using the combination of the two best genes compared to using five of the six most stable genes . From our results, we recommend consulting the literature for appropriate reference genes according to the tissues and species under investigation. If healthy tissues are included in the study design (e.g. baseline values, negative controls) the reference genes should be evaluated in healthy individuals. If the corresponding data is not available, preliminary experiments for the identification of optimal reference genes are necessary. If this is impossible, we recommend using RPS7 as the primary choice for a reference gene in feline tissues (with tissue-specific limitations documented in the present study); results should be confirmed using other reference genes, such as ACTB, ABL, GUSB, and/or YWHAZ. In this study, we investigated the most reliable feline reference genes for normalisation of gene expression data in blood samples and 15 different tissues, including endocrine, lymphatic, and gastrointestinal tissues, using real-time TaqMan® PCR assays and pair-wise and ANOVA-based analyses. Our results indicated that stability of the reference genes varies among the different tissues, and no gene was found among the most stable ones for all the tissues under investigation. Moreover, significant differences were found using either pair-wise or ANOVA-based analysis approaches. The three most stable genes were RPS7, ACTB, and ABL, while B2M, HPRT, and the 18S rRNA gene were the least stable ones. The frequently used GAPDH had an acceptable stability in a few tissues. These data emphasise the need for proper validation of candidate reference genes in the respective tissues and species in healthy individuals preceding the initiation of any experimental gene expression study. Yvonne Kessler, A Katrin Helfer-Hungerbuehler contributed equally to this work. tyrosine 3-monooxygenase/tryptophan 5-monooxygenase activation protein, zeta polypeptide. We thank the Novartis Centre de Recherche Santé Animale SA (Saint-Aubin, Switzerland) and Drs. E. Zini and M. Osto for kindly providing feline tissue sample. We thank the animal caretakers, technicians, and doctoral students of the Clinical Laboratory, particularly T. Meili Prodan and B. Weibel, for expert technical aid and excellent laboratory assistance. Molecular biology work was performed using the logistics of the Center for Clinical Studies at the Vetsuisse Faculty of the University of Zurich. RHL is the recipient of a professorship from the Swiss National Science Foundation (PP00B-102866 and PP00P3-119136). This study was conducted by YK as partial fulfilment of the requirement of a doctoral thesis at the Vetsuisse Faculty of the University of Zurich. YK performed and analysed the research and drafted the manuscript. AKH designed the assays, performed statistical analyses, prepared the figures, and co-drafted the manuscript. VC and MLM participated in the assay design and data analysis and revised the manuscript. BZ performed molecular assays. PO performed the necropsies, the macroscopic and histological analysis, and the sample collections and revised the manuscript. BR was responsible for the SPF cats, housing, animal care, and the blood collections and revised the manuscript. CER contributed to the study design (endocrine tissues) and provided some feline tissues. HL contributed to the study design. RHL conceived and supervised the study, participated in the data analyses, and edited the manuscript. All authors read and approved the final manuscript.